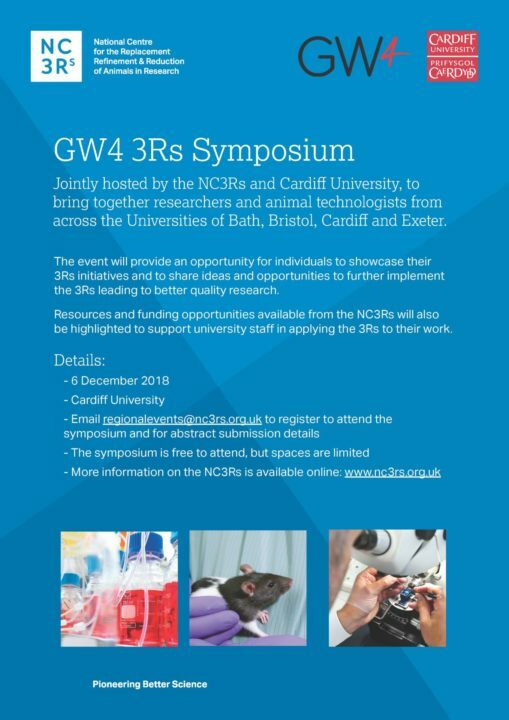 The first GW4 3Rs Symposium is to be held at Cardiff University and is jointly hosted by the NC3Rs (National Centre for the Replacement, Refinement and Reduction of Animals in Research), to bring together researchers and animal technologists from across the Universities of Bath, Bristol, Cardiff and Exeter. The GW4 3Rs Symposium 2018 will take place on 6th December at Cardiff University. This event is free to attend and is aimed at all those engaged in research (both animal research and those working with potential replacement technologies). It will provide an opportunity for individuals to showcase their 3Rs (replacement, reduction and refinement of animals in research) initiatives and will also highlight resources and funding opportunities available from the NC3Rs. Poster submission: The symposium offers an excellent opportunity for you to present your own advances in the 3Rs during the poster session, with the opportunity to win one of two £100 prizes. Please complete the GW4 3Rs Symposium 2018 application form if you would like to submit an abstract and email it to regionalevents@nc3rs.org.uk by Friday 2 November. Attendance only: If you wish to attend without submitting a poster abstract then please also complete the GW4 3Rs Symposium 2018 application form and email it to regionalevents@nc3rs.org.uk by Friday 16 November (please note that spaces are limited and priority will be given to those presenting posters).